This page contains a single entry by Willis Fleming Historical Trust published on November 8, 2008 4:24 PM. Heritage Lottery Fund Rescues Shrine was the previous entry in this blog. Remembrance service at Havenstreet 2008 is the next entry in this blog. The Act of Remembrance on 8 November 2008 marked the official start of the one-year project, and took place during the weekend that commemorated the 90th anniversary of the end of the First World War. One hundred people attended the event. The service was led by John Owen, Rector of North Stoneham and Bassett, and Richard Davies, Vicar of Eastleigh and Chaplain to the Royal British Legion. 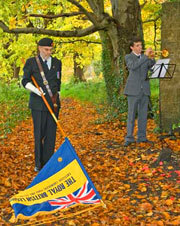 The Last Post and the Reveille were played by Will Anderson of the Southampton Youth Orchestra. 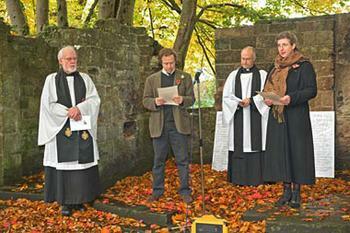 The names of the war dead were read by Jane Wildgoose and Tom Willis Fleming. 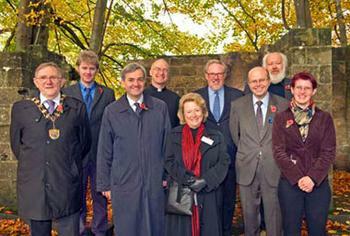 Legion; Jenna Dewhurst, Ranger, Avenue Park; John Willis Fleming, representing the Willis Fleming Fleming Historical Trust; Sue Runyard, representing the Heritage Lottery Fund; Janet Hurrell representing the Hampshire Gardens Trust; Chris Huhne MP. ; and Jane Wildgoose, representing The Wildgoose Memorial Library. 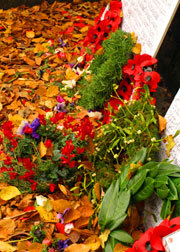 As the service closed, other symbols of remembrance and hope, such as single flowers and crosses were laid at the Shrine. 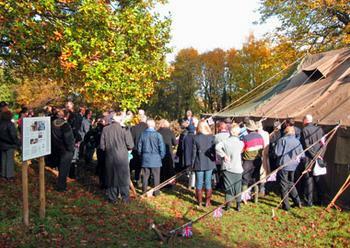 After the service, refreshments were served in a large army tent, and the project was introduced by Harry Willis Fleming, Councillor Chris Thomas, Sue Runyard, and Chris Huhne MP. (From left) Richard Davies, Vicar of Eastleigh and Chaplain to the Royal British Legion; Tom Willis Fleming; John Owen, Rector of North Stoneham and Bassett; Jane Wildgoose. (From left) The Mayor of Eastleigh, Derek Pretty; Harry Willis Fleming; Chris Huhne MP; Rev. John Owen; Sue Runyard; Tony Hurrell; Peter Atkinson; Cllr. Chris Thomas; and Jenna Dewhurst. Copyright © Project Steering Group / Trustees of the Willis Fleming Historical Trust. All rights reserved. Sitemap.